5pm to 7:30pm: Sign-in, packet pick up, drop bag drop off, Vendor Expo & camping opens. Gear drop off for transport to finish line. 2:00pm: Post race food for volunteers and runners will be available. Fresh food will remain available for all runners through the end of the event. We are on the beach! Have your friends and family bring swim suits, and towels. Plenty of room for picnics. Grill are also available for cooking. Drop bags that are picked up along the course will be delivered to finish line area as aid stations close down. The race will have a 20 hour cut off. Cut off times will be enforced. Runners must leave the aid station ahead of the established cut off time. Aid Station Managers and/or Race Officials will enforce this policy. If you choose to drop out of the race for any reason, you or your crew must find and notify any aid station volunteer. It is critical that the race officials can maintain an accurate accounting of which runners are still on the course and where they are. Failure to abide by either of the policies above will result in a lifetime banishment from this event. This is a great race for spectators. There will be several locations where you will have easy access to meet, support and cheer on the runners as they pass through the course. However, to be gracious guests, we ask that each crew limit themselves to one vehicle. We must stress that crew not try to gain access to non-crew aid stations. Our aid station locations are critical to our success. Unwanted traffic at these sites put those aid stations in jeopardy. We have had this problem in the past and will disqualify runners whose crew attempts to bend the rules. If you are asked by a Race Official, aid station Manager or volunteer to relocate your vehicle, please listen! Aid station maps will be made available to help guide crews to aid stations. Crew members are forbidden to support runners outside of the aid station areas. Runners caught receiving support outside those areas will be disqualified from the event. Pacers will be allowed during the Twisted Branch. Pacers are allowed solely as a safety consideration for potentially fatigued runners. Pacers can only join in the race at two locations. Pacers may be running at night and therefore must have a headlamp or flashlight to stay on course. Pacers must be at least 18 years of age. Exceptions may be considered. Pacers must stay with their runners at all times. Pacers must meet runners at the a aid station areas and depart that aid station with their runner. Pacers may not continue on the course if the runner being paced is pulled, or drops out of the race. Pacers must arrive and depart from Aid Stations with their runner. Only one pacer is allowed to be pacing a runner at a time. Runners can utilize two different pacers during the event. If you are looking for a Pacer or you are interested in pacing, please click the button below and complete the form. At both the start and the end of the race you will have access to indoor bathrooms. Most of the aid stations will also be equipt with port-a-johns. While aid stations will be stocked with a basic first kit for your needs, the race will not provide any formal medical support for runners. We have a medical director on staff. We also work closely with local emergency organizations in preperation for the event. If there is an emergency, call 911 for help. It is also very important that you stay on the trail. You will be running through very remote sections of Upstate NY. If you are feeling like you are lost, it is important that you stay where you are. Do not continue or wander off the trail. Wait for a fellow racer, or our staff, who will be performing a sweep of the course to make sure all runners have cleared the course safely. 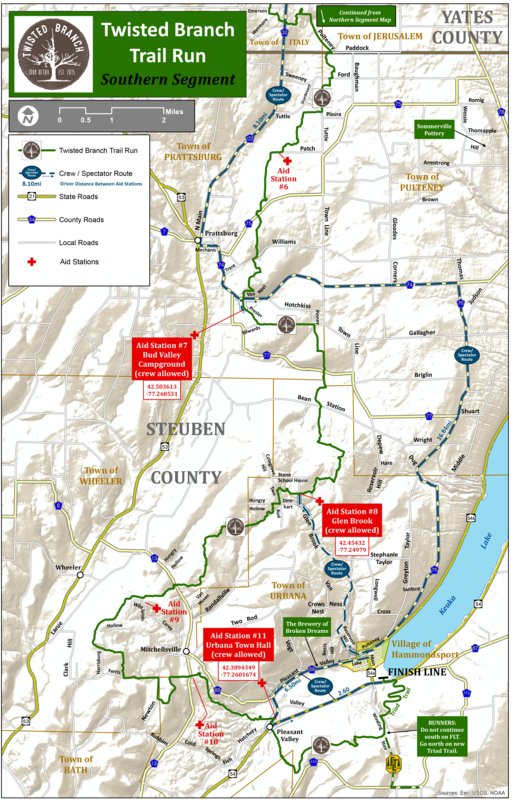 We have provided trail maps, and a course elevation profile with aid station locations. While you won’t get lost, we are pretty sure you will get worn out. With 10,000 feet of elevation gained/loss in the day, and no mountain to speak of, you’ll be climbing, and descending all day long. Since we are following the FLT, we encourage you to stay tuned to current trail conditions, seasonal reroutes, and changes to the trail through the FLTC website. There will be 11 fully stocked aid stations and a handful of quick-fueling stations along the course. We have worked carefully with the community, landowners, authorities, and the FLTC to locate these aid stations in the best possible locations. We have provided you with a breakdown chart of all of the aid stations, and their locations and proximity to the starting line. Crew access and drop bags are not allowed at all of the aid stations. Also, don’t forget only one car per crew will be allowed! There is really no better time to visit the Finger Lakes region than in the late summer. There are hundreds of options available for you to find places to stay and enjoy the area. Bed & Breakfasts, Cottage Rentals, Hotels, Motels, and Camping. Take your time to look around, and plan a trip to the area. There is so many things to do in the Finger Lakes. You'll be in the heart of the Wine trail, Keuka Pottery trail, and so much more. Check out our travel page for links and information. With a race this long we are always looking for anyone interested in volunteering to help make this event fun and safe for the participants. If you are interested in helping out, please don’t hesitate to reach out to us. We'll be glad you did! 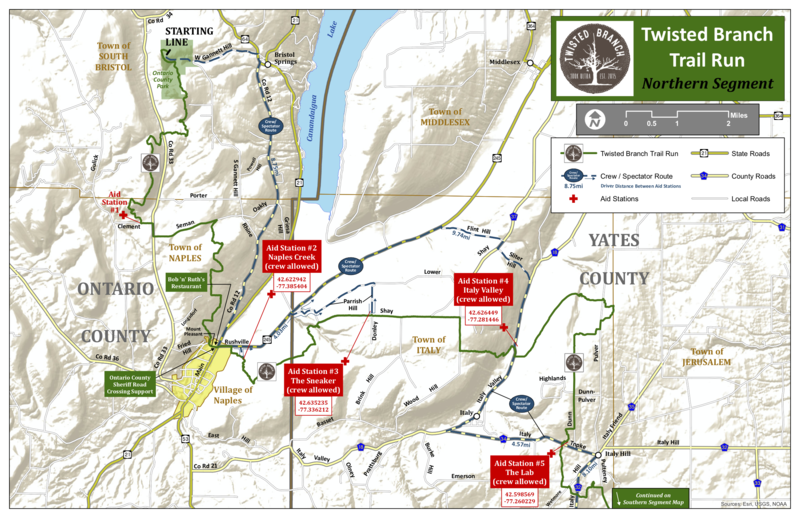 Don't miss your chance to be part of the Twisted Branch Trail Run. Entry to the race will be limited to 150 people, so we think it's a good idea to sign up now. This race couldn't be possible without the support from our sponsors and partners.. Check out who they are, and what they are all about. You'll find cool stuff, and ways to give back to the trail.